Joseph Eichler was a pioneering developer who defied conventional wisdom by hiring progressive architects to design Modernist homes for the growing middle class of the 1950s. He was known for his innovations, including "built-ins" for streamlined kitchen work, for introducing a multipurpose room adjacent to the kitchen, and for the classic atrium that melded the indoors with the outdoors. For nearly twenty years, Eichler Homes built thousands of dwellings in California, acquiring national and international acclaim. 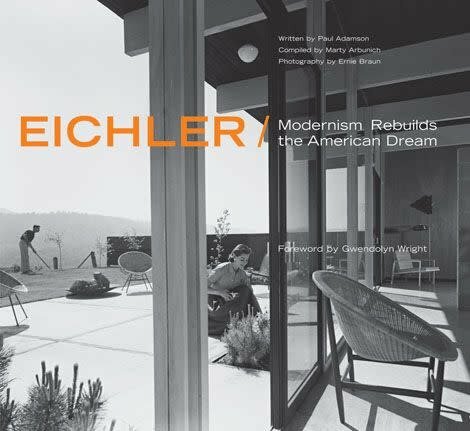 Eichler: Modernism Rebuilds the American Dream examines Eichler's legacy as seen in his original homes and in the revival of the Modernist movement, which continues to grow today. The homes that Eichler built were modern in concept and expression, and yet comfortable for living. Eichler's work left a legacy of design integrity and set standards for housing developers that remain unparalleled in the history of American building. This book captures and illustrates that legacy with impressive detail, engaging history, firsthand recollections about Eichler and his vision, and 250 photographs of Eichler homes in their prime. Paul Adamson, AIA, holds a Master of Architecture degree from Columbia University and has practiced in New York and San Francisco. He is currently a designer at the San Francisco firm of Hornberger + Worstell, Inc. He lives in Kensington, California. Marty Arbunich is director-publisher of the Eichler Network, a Bay Area-based company devoted exclusively to supporting and preserving the architecture and lifestyle surrounding California's 11,000 Eichler homes. He lives in San Francisco.